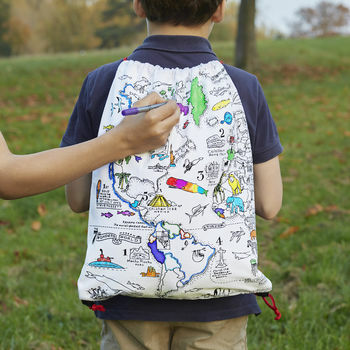 fun, creative and educational textile gifts to colour and personalise with the included wash-out pens! Best of all, the ink completely disappears on a warm machine wash, all ready to start again – endless fun and endless creative freedom! 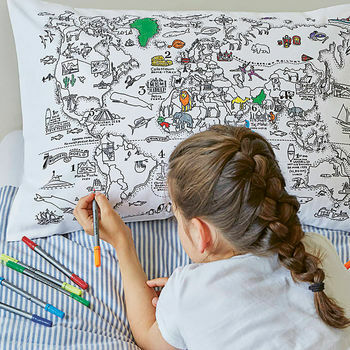 "Ideal gift for a boy who loves colouring in and is fascinated by the world and countries"
"Very original, useful as well as educational"
"Cannot wait to use this for when my grandchildren come for dinner! 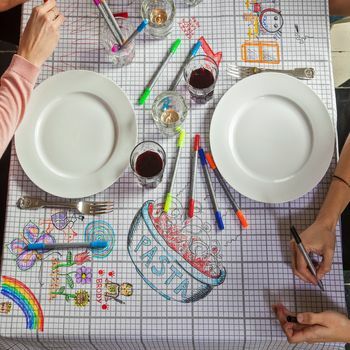 Such an absolutely brilliant way of keeping them amused at the table! Love it! 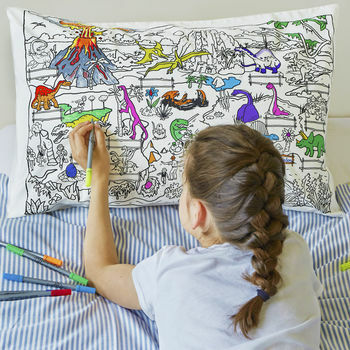 What a fabulous gift for families! Or anyone creative!" 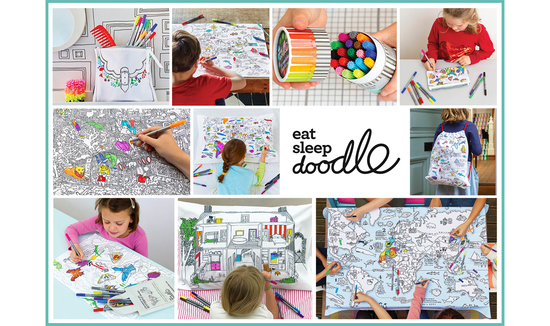 "This ingenious set of four placemats from eatsleepdoodle will make mealtimes fun for younger diners." "My niece absolutely loved this (butterfly crossbody) bag and has never had anything like it before. She said, ‘this is magic!’ (after all the colours completely washed out!)" We aim to dispatch in-stock orders within 2 business working days to arrive with UK customers within the following 2-5 days depending on the service used and delivery address. Please note that we are unable to guarantee these estimated delivery dates. Please be aware that your order will take a little longer to process if you place it on a Friday or a Saturday. On request, we may be able to expedite delivery for customers, please call us for availability and pricing. If goods are out of stock we will offer you the option of keeping the goods on backorder or receiving a refund. We use Royal Mail First Class, Parcel Post or a courier service to deliver your order. Please note that our courier service requires a signature on receipt. If the courier is unable to deliver, a card will be left with a contact number to arrange re-delivery or collection from the nearest depot. Please note, if no contact is made with the couriers within 7 days of attempted delivery, the goods will be automatically be returned to us. This page (together with the documents referred to on it) tells you the terms and conditions on which we supply any of the products (Products) listed on the Stitch designworks section of the NOT ON THE HIGH STREET website to you. You should understand that by ordering any of our Products, you agree to be bound by these terms and conditions.You should print a copy of these terms and conditions for future reference. Please understand that if you refuse to accept these terms and conditions, you will not be able to order any Products from our site.If you have any questions relating to these terms and conditions before placing an order please contact us by e-mail or telephone. We take great care in portraying the products on this website as accurately as possible, ensuring that product descriptions and specifications are correct at time of publication. However, colour reproduction and image representation are dependent on your monitor's display and colour capability so we cannot accept responsibility for any colour misrepresentation or variation. At times it may be necessary to make changes to the specifications of our products and we reserve the right to make such changes without notice. Once an item is sold out it will be taken off the website at the earliest opportunity and may not be available again. All prices shown on the web-site are in £ sterling and are inclusive of VAT. There is an additional charge for delivery. Please note offers may be withdrawn at any time. Prices are liable to change at any time, but changes will not affect orders in respect of which we have already sent you a Dispatch Confirmation. Our site contains a large number of Products and it is always possible that, despite our best efforts, some of the Products listed on our site may be incorrectly priced. We will normally verify prices as part of our dispatch procedures so that, where a Product's correct price is less than our stated price, we will charge the lower amount when dispatching the Product to you. If a Product’s correct price is higher than the price stated on our site, we will normally, at our discretion, either contact you for instructions before dispatching the Product, or reject your order and notify you of such rejection.We are under no obligation to provide the Product to you at the incorrect (lower) price, even after we have sent you a Dispatch Confirmation, if the pricing error is obvious and unmistakable and could have reasonably been recognised by you as a mis-pricing.VAT is deducted from all export orders but any customs or import duties will be your responsibility. After placing an order, you will receive an e-mail acknowledging that we have received your order. Please note that this does not mean that your order has been accepted. Your order constitutes an offer to us to buy a Product. All orders are subject to acceptance by us, and we will confirm such acceptance to you by sending you an e-mail that confirms that the Product has been dispatched (the Dispatch Confirmation). The contract between us (Contract) will only be formed when we send you the Dispatch Confirmation.The Contract will relate only to those Products whose dispatch we have confirmed in the Dispatch Confirmation. We will not be obliged to supply any other Products which may have been part of your order until the dispatch of such Products has been confirmed in a separate Dispatch Confirmation. failure to meet the eligibility to order criteria set out in these Trading Terms. We will take all reasonable care, in so far as it is our power to do so, to keep the details of your order and payment secure, but in the absence of negligence on our part we cannot be held liable for any loss you may suffer if a third party procures unauthorised access to any data you provide when accessing or ordering from the Website.